Most driver licenses in the US and Canada are AAMVA compliant (see American Association of Motor Vehicles, AAMVA.org) and have a PDF417 barcode printed on the back of the license. Scan-ID reads the PDF417 barcode and automatically places the information extracted from the barcode into their respective fields such as name, birthdate, address, city, state, postal code, ID number, issue and expiry dates. 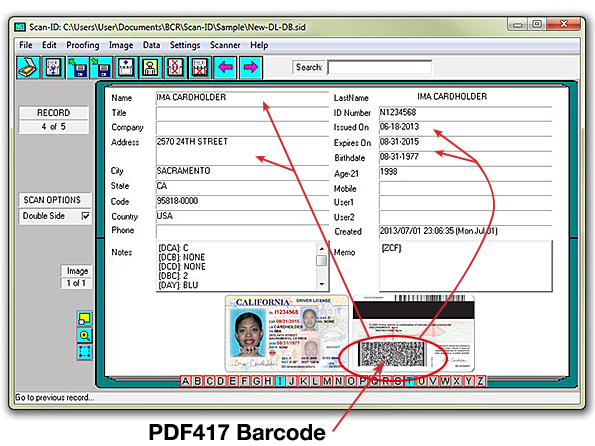 Scan-ID is capable of locating and reading various 1D and 2D barcodes in an image. The currently supported bar code types are Code39, Code128, EAN-8 EAN-13 (including UPC-A and UPC-E), and PDF417.